That Department of Fish and Game announcement doesn’t seem to be hurting boat loads in this year’s Golden North Salmon Derby. Derby officials said contestants are actually catching more fish than last year. If you can’t have the biggest king, you might as well catch all the silvers your ice box can hold. Derby workers are hunched over dragging tubs of silver salmon, or Coho, across the bare wood of a float in the Auke Bay harbor. They’re working on filling up super-sized plastic containers with the fish derby contestants are reeling in. Kami Bartness is in charge of the three stations that weigh fish for the Golden North Salmon Derby. She said even though contestants aren’t allowed to target the prized king salmon, Juneau residents aren’t snubbing the three-day contest. “I think the first day, from all the weigh stations; we’re probably looking at about 1100 validations, which is pretty comparable to last year,” Bartness said. Contestants brought in about 16,000 pounds of fish on the first day of the contest, Bartness estimated. “That’s better already than last year – the first day,” Bartness said. Last year, the derby landed about 18,000 pounds. Fish and Game banned king fishing a week before the derby’s start because of record-low fish numbers. Historically the derby’s heaviest fish have been kings. This year, first place will go to a silver. Derby officials said this is the first silver-only derby in its 71-year history. But, Bartness said it’s logical that the closure isn’t hurting the contest. Bartness said last year, contestants only asked to put 70 king salmon in the running for a prize. “So about 85 percent of all the proceeds came from Coho anyways,” Bartness said. 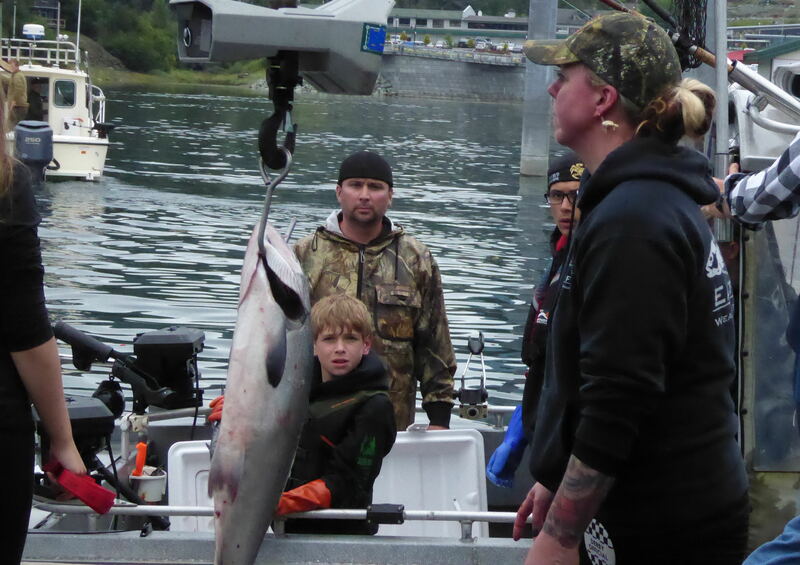 Katherine Dimond won first place last year with a 27-and-a-half pound king salmon. Midway through this year’s derby, the biggest Coho weighed is just under 19 pounds. Bartness said the good news is many of the fish that don’t have a chance to win are being donated toward the Territorial Sportsmen Scholarship Foundation. Territorial Sportsmen, the derby’s organizer, puts the money into a scholarship fund and each year they give earnings from that fund to several local graduates to use for their next education goals. According to the derby website, last year’s derby fish were worth slightly more than $24,000. Derby officials plan to finalize results for the 2017 derby and announce winners on Tuesday. Quinton Chandler is a reporter at KTOO in Juneau.